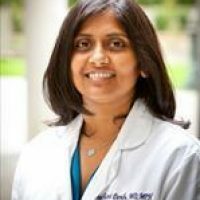 Madhavi Dandu, MD, MPH is an associate professor of medicine at the University of California, San Francisco. Her main nonclinical areas of focus are in global health education, curriculum development, and mentorship. She is a director of the Master of Science in Global Health, a one-year program designed for students or practitioners in a health science profession or related field who wish to achieve mastery and leadership skills in the field of global health. Dr. Dandu also directs the Global Health Pathway/Area of Distinction for the Internal Medicine Residency. In this capacity, she coordinates international experiences of residents, assists with their scholarly projects, and provides curriculum for those committed to careers in global health. She is also co-director of the Global Health Core for the Division of Hospital Medicine and a senior curriculum adviser for the HEAL Fellowship. Dr. Dandu continues to pursue her teaching and research interests in human rights, ethics, and global public health. Dr. Dandu received her undergraduate degree in comparative literature and medical degree from the University of Michigan in Ann Arbor. She completed her residency training in the Categorical Medicine Program at UCSF in 2003 and received a Master in Public Health with a focus on international health and health and human rights from the University of California, Berkeley. Prior to returning to UCSF, Dr. Dandu spent two years at the University of Michigan with the Department of Medicine in the hospitalist group providing inpatient clinical care to patients and teaching residents and medical students. At UCSF, Dr. Dandu spends time on the inpatient clinical services supervising and teaching medical students and residents.